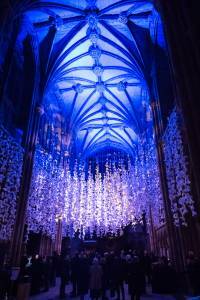 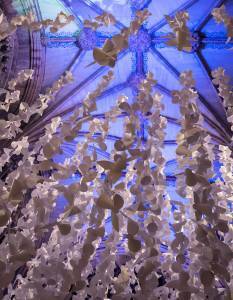 Alongside the Son-et-lumiere viewers that had free tickets were able to continue inside the Cathedral to witness the art installation of 10,000 angels created by Artist in Residence Peter Walker Sculptor. 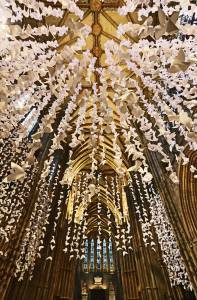 Ten thousand school children from the district each wrote a Christmas message inside a paper angel which were then suspended in the south transcept of the Cathedral for the duration of the installation throughout the Christmas period. 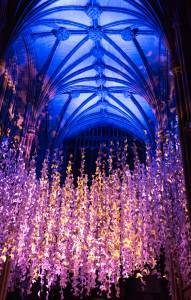 In 2015 “A Cathedral Illuminated” was a 2 day large scale projection event onto the West Front of Lichfield Cathedral. 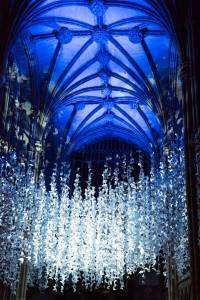 The 40min show was repeated 6 times each evening drawing a crowd of around 6000 people.